SIIJLA has been requested to circulate the following event happening in Los Angeles on Mrch 24, 2018. Ahlulbayt TV hosts its inaugural event in California on Saturday, March 24th in honor of the birth anniversary of Imam Ali (as) at the Islamic Educational Center of Orange County. 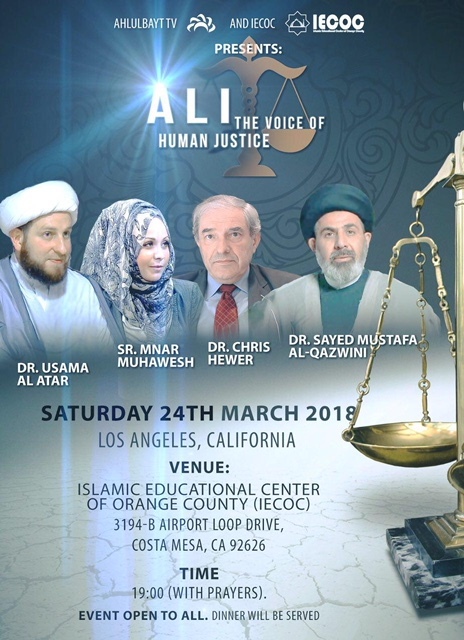 The event titled - Ali: The Voice of Human Justice, will feature prominent speakers who include: Dr. Sayed Mustafa Qazwini, Dr. Sheikh Usama Al-Atar, Sr. Mnar Muhawesh and Dr. Chris Hewer. The event is open to the public. Dinner will be served.